…or maybe that should be prints in Gauguin…Japanese prints, that is. There’s a big show of Paul Gauguin’s paintings at the Tate Gallery in London this month. He’s a little overlooked compared to contemporaries such as Van Gogh so the current show comes as a welcome revival. The huge influence of Japanese prints in the work of both artists should not be underestimated. Van Gogh made direct copies of Hiroshige prints, writing to his brother that, “this day I have found something wonderful that I shall surely copy,” but it is perhaps less well known that Gauguin also made copies of Japanese prints as in the two paintings illustrated. Woodblock prints were used to pack trade goods towards the end of the nineteenth century. 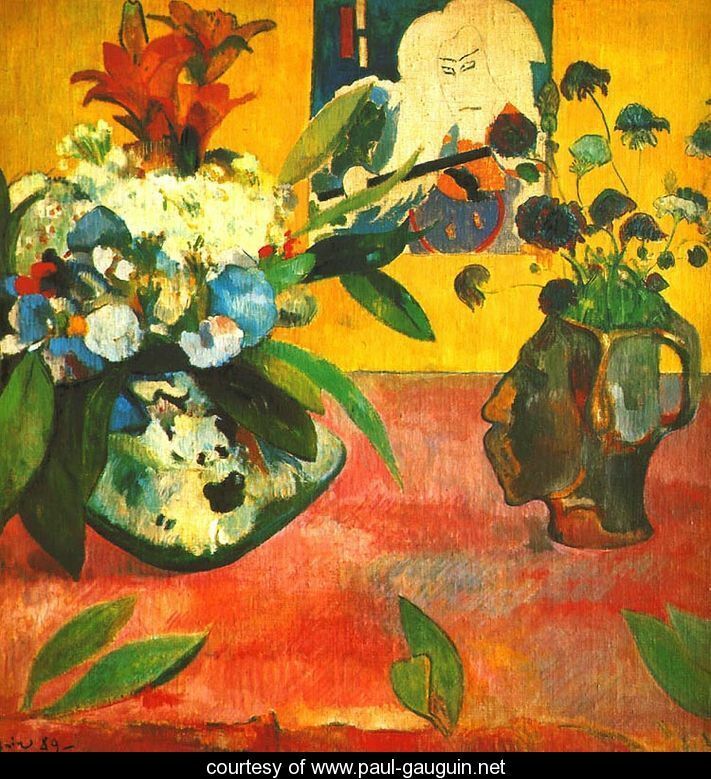 The flat areas of colour, the perspective and the unusual compositions chimed with the young artists of Europe and were quickly assimilated with the innovations of Cezanne and the Impressionists to make a modern, symbolist art that was more sensuous, more decadent and more abstract than the European tradition. All of this is very evident in these two pictures. 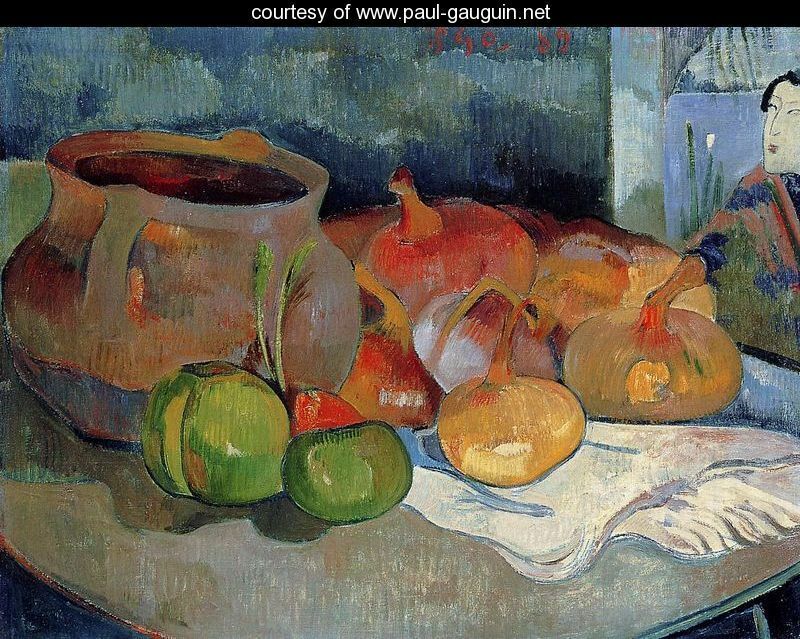 Gauguin’s debt is clear enough in the painted copies of the prints and the flattened space of the later painting, as is his debt to Cezanne in the brushstrokes and composition. Surely though, his later paintings from Tahiti display all the characteristics of the floating world… the lazy, sexual undercurrent, the panoramas of available women, the absence of the modern day and the explicit suggestion of pleasure, all laid out frieze-like on the canvas against a background of flat colour or worked pattern. I’ve done a bit of research to identify the prints in these paintings… the later still life depicts a print by Utagawa Yoshiiku from 1864 of the actor Ichikawa Kodanji playing the hunter Nagohe with his wild white hair and a spear in his hand. 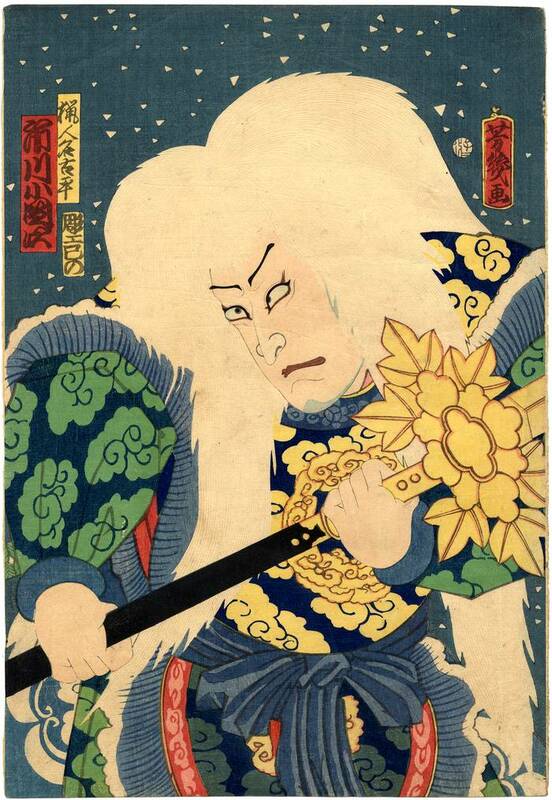 The other painting shows an actor print by Kunisada. We are showing two warrior prints by Yoshiiku in the current exhibition at the Toshidama Gallery along with other major artists of the Utagawa School. This entry was posted in Cezanne, Hiroshige, Japanese Art, japanese woodblock prints, Kunisada, Paul Gauguin, Toshidama Gallery., ukiyo-e art, Utagawa Yoshiiku, Van Gogh and tagged Cezanne, floating world, Hiroshige, japanese art, Japanese prints, Japanese Woodblock Prints, Kunisada, Paul Gauguin, Tate Gallery, Toshidama Gallery, Ukiyo-e, Van Gogh, Yoshiiku. Bookmark the permalink.